Killingholme Hoard - press photograph. One Sunday morning in November 1993, Adrian Caley discovered the Killingholme hoard while detecting in a field in Lincolnshire near the Immingham docks. 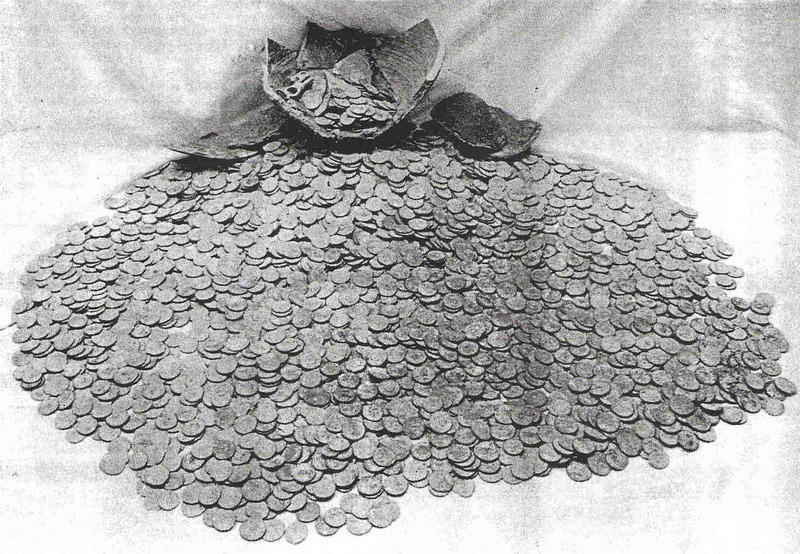 The hoard comprised about 3,800 bronze coins. Under the existing laws, as precious metal was not involved, the coroner judged that an inquest was not required and the coins were returned to the finder. This was before PAS (Portable Antiquities Scheme) and the new UK Treasure Act came into force. The finders kept some representative samples but the bulk of the coins were sold to Spink of London. However, the BM (British Museum) did have the opportunity to examine and record the coins briefly before they were consigned to Spink for disposal. The BM also acquired 86 coins from the hoard. It is likely that the hoard was deposited around AD 332 or 333. This is indicated by appearance of only the first two issues of the commemorative series from Trier for example. Spink took consignment of the first batch of the coins from the BM in early 1994, the rest arrived in batches soon after. The BM records reflect this handling of the coins in batches. Spink listed a number of coins for sale in the Numismatic Circulars during 1994 starting with the June issue. A few are still being offered through the trade and are still obtainable. 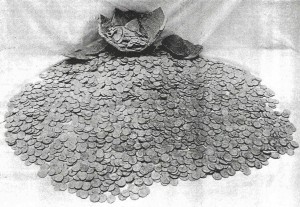 An article recording the finding of the hoard was published in “Treasure Hunting” magazine in May 1994 and an alternative version of events is available here.